Sites based on user generated content (UGC) are extremely popular right now. UGC even powers some of the largest sites on the web like Yelp, Wikipedia, and Stack Overflow. On top of that, it is becoming even easier to add UGC to your site through apps like BBpress or Sponge. If you don’t have some form of UGC on your site, you should look into adding it as there is a lot of value in it, especially if you run an ecommerce site with a lot of boilerplate text. Unfortunately, many UGC sites didn’t think too much about SEO when they were set up and don't get the competitive edge provided by SEO. This is a guide to help you get your user generated content optimized - a lot of this focuses on keyword targeting, but with UGC proper keyword targeting and on-page set up can make a significant difference. 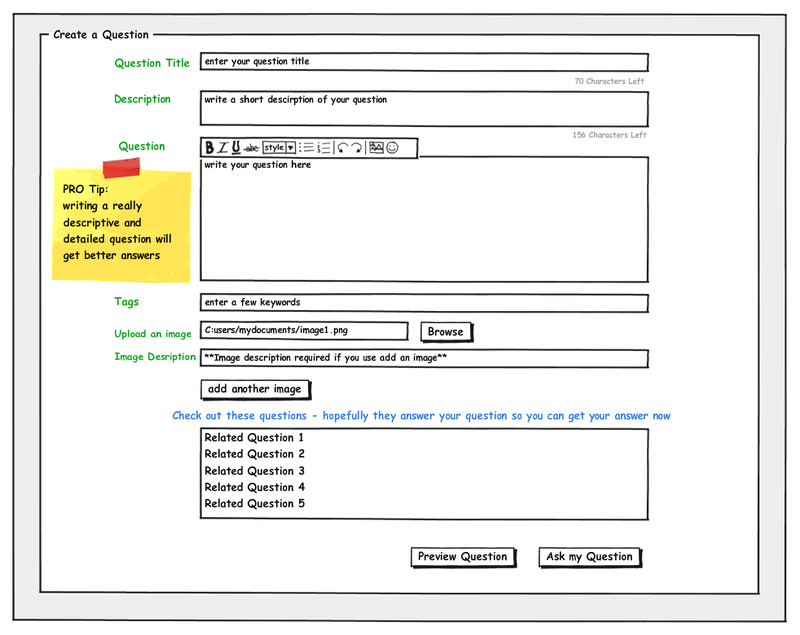 I have put together an example of a good question creation interface. Most Q&A sites have a variation of this, but I think this has a couple features, such as the encouragement to write descriptive questions and related questions, that many sites don't have. The following are on page elements that affect SEO; I will be using the above Q&A example as a reference throughout the post. As the most important on-page element, this is where you want to put your most important keyphrase: the title of your question. If you have strong brand recognition, including your brand name in the Page Title can increase click throughs as people tend to have more trust in a recognized brand opposed to an unknown website. If you have a trusted brand, I recommend putting your brand name at the beginning of the page title. As Google typically give you 70 characters to use for your Page Title, you should either set the length of the title at 70 characters, or subtract the length of your brand from the limit. If you have a Page Title longer than maximum that Google displays, Google will truncate the URL so that it fits within it's character limit. I like to set a limit on the title length; I think it helps keep the titles keyword rich and focused as well as help reduce the amount of stop words users put in the title. Sometimes, due to terminology, it is difficult to fit a descriptive question title into 70 characters; a solution would be to call it the "suggested title length" and show how many characters have been used rather than putting a hard limit on the number of characters. For this example, I would set the question limit to 58 characters. Like the Page Title, this attribute should be set to display your question title. A lot of designers will set the content title to something other than an H1. While it isn't critical that you have a keyword rich H1 tag, I have still seen positive benefits from using an H1 tag and encourage the use of it. It is much easier to work with designers and developers throughout the creation process rather than trying to fix SEO elements after the fact. Try and infuse SEO (and yourself) in every step of the production process. You can do this by setting up "SEO reviews" that each step of the project has to go through or by setting up recurring meetings with the people creating the product to answer any questions and give feedback (tell them what needs to be fixed). Your slug should be formatted with the content title and a numerical identifier. I also recommend putting as few folders in the URL as possible. It tends to be better for users if you use shorter URLs, it is much easier for users to copy/paste, read to someone, or write down. When you have a short URLs and users paste your link somewhere without using anchor text, you are getting better anchor text than if your had several folders in the URL as you won’t have semi relevant words in the URL. Don’t forget, use dashes instead of underscores or spaces. While you could just take the first 156 characters of the content, it is better to ask users to provide a brief overview of the question to use as the Meta Description. Frequently the beginning of a question is build up and background information that doesn't really get at what the question is. Asking for a brief description gets a better overview of the question than taking the meta description directly from the content. If users want to upload an image, require that they write a short description for it. Having alt text for all your images is a requirement for being W3C compliant and having keyword rich alt text helps reinforce your keyword targeting for the page. Typically you want to use 3 - 5 words to describe the image. Most file names associated with images are terrible, such as DSCN12463, and do nothing to help your SEO. In almost every case you will want to change the file name during the upload process. When renaming the image, use a format such as: image-description-numerical-identifier. This will further associate keywords with the image and page. Example of a new file name: screenshot-of-wp-theme-5216.png. The number can be used to ensure that all images have unique names while you get the benefit of putting keywords in the image name. There are a couple benefits to having really descriptive and detailed questions; the answerers are able to give much better answers as they have more insight as to the situation the asker is facing. For Q&A topics like tech or cars, there are a ton of variables that can have a huge impact on the solution so it is critical to get these details so that users can answer questions more readily. Getting a user to write a really descriptive question is better for you, the SEO, as well. Creating detailed, high quality scalable content is great, right? This is often overlooked in the question creation process. The goal of this is to reduce duplicate content and have as much conceptually unique content as possible. On many large sites with Q&A, many questions have already been asked. It’s better to add to an existing page than create a new one on the same topic. Creating new pages targeting the same keywords just creates duplicate content and keyword cannibalization. This is especially important for newer or less authoritative sites as Google’s indexation is directly influenced by the value of a site as indicated by its backlinks. You don’t want search engines wasting their resources crawling and indexing a lot of questions that are targeting the same keywords. User generated content has a lot of benefits like doing really well in the long tail and reducing the amount of content that you have to create yourself, but for it to be successful, it is really important for the content to be set up correctly. If your user generated content is already well optimized, you should focus on increasing your site’s authority by using your community to build links. Optimizing user generated content pages is about collecting data upfront rather than optimizing after content is created. As UGC is so scalable and can grow so quickly, it is not realistic to go back and optimize pages individually. It is critical to collect data and systemically optimize the pages as they are created.